Fairness is easily misunderstood by a small child. She will tend to perceive anything preventing her from fulfilling every desire as being unfair. As she grows from an egocentric child into a socially adept adult, she will come to understand that other people have thoughts, feelings, and perspectives that are different from hers. She will understand that nobody, including adults, gets everything they want. An accurate concept of fairness materializes in concert with these cognitive advancements, provided some parental guidance is given along the way. Your consistent practicing and teaching of fairness will help your child to understand and embrace the concept. The concept of fairness can be succinctly expressed using competitive games as an analogy. Fairness is having the rules declared before the game is played, having the same rules apply to all the players, and having impartial hearings for accused rule breakers. You, as the parent, have the unenviable position of being a coach, a rule maker, a player, and a referee in the game. Remaining fair amid your conflicting interests in these roles is a precarious balance, but one you must keep in order to demonstrate fairness to your children. You have the responsibility of making sure the rules and expectations are clear to your child. She cannot be expected to follow unpublicized rules or to meet unspoken expectations that to you seem like common sense. You have to provide explicit instruction. In that respect, you are like a coach openly discussing the procedures and consequences. The corollary of that is that you also have the privilege of setting some of those rules. In your capacity as rule maker, you may introduce new rules spontaneously to adapt to changing circumstances, but those new rules can never be applied retroactively. New rules may only apply to future gameplay. If the rules are to be an effective backdrop for gameplay, they must be thoughtfully formulated. As an example, we once created the rule that milk must be kept in its cup until consumed. If the milk was instead poured onto the dinner plate, with inevitable incidental floor spillage, then no milk refills would be supplied for that meal. This rule was imposed specifically to address my one-year old daughter’s messy eating habits. We explained the new rule to her while we were cleaning up milk. I calmly pointed to her fresh cup of milk and repeatedly instructed her to keep her milk inside, and she understood. She complied with the rule, but not how we expected. She adopted the practice of taking the food from her plate and plopping it into her cup one by one, and then consuming both food and drink from the cup. While unappetizing for us to observe, it was consistent with the rule as stated. So it would have been unfair of us to chastise her at that point for putting food in the cup, even though at first blush the seemingly willful disregard for the spirit of the rule felt mildly insulting. Berating her creativity would have been retroactive enforcement of a new rule, and an abuse of our parental authority. What we could have done, however, was amend the rule for the future to require that food also be kept in its original serving container until consumed. While tempting, we opted not to do that. Although Daughter was not capable of articulating her motives, it was clear that she was not creating messes just for her own amusement as we suspected, nor was she intent on displeasing her parents for attention. Daughter just liked her food to be softened by her beverage. She liked turning dinner into a milky soup, almost like cereal. She was preparing her meals the way she wanted them. And with the modified method that she created, there was no spillage. So she got what she wanted in a way that allowed us to have our way as well. So long as her inventive circumvention of the milk-in-cup rule didn't impose on other members of the family, we ultimately decided that it was her prerogative to eat the way she preferred. Like adults, children find imaginative and ingenious ways to contrive freedoms from within the confines of a set of rules. For that reason, be sure to think through the rules before you declare them. Envision ways they may be adhered to, and ways they may be bypassed. Also consider the socialization among the rules in place, and clarify what happens if any rules appear to conflict with one another. For example, if you've told your child she can spend her own money as she wishes, but there are house limits on candy, what happens when she buys her own candy? When you have a well-constructed code of conduct in place, your newly instituted rules will be meaningful, respected, and amenable to consistent enforcement. And through your example as coach and rule maker, your child will have a blueprint for organizing activities within her social group, such as creating games or proposing methods to take turns. If you instead have a set of rules full of loopholes and contradictions, you will be forced to extemporize. You may appear to be vacillating among an indiscriminate set of confusing decrees to suit your own fancy. And, by your example, you will be teaching your child to arrange the rules to her advantage regardless of whose rights they infringe. She may follow your lead by improvising a set of shallow rules among her playmates that are always favorable to her immediate situation while disadvantaging others. And in the process she will have created a whole set of unnecessary social issues to maneuver through. One key consideration when setting rules is that you will be expected to follow the rules as well. In this respect you are one of the players in the game. If the television is to be turned off at mealtimes because that time is reserved for conversation, then don't pick up your smart phone during dinner. If politeness is required in your house, then be courteous and model apt usage of words like ‘please’ and ‘thank you’ when speaking to your child. If your child is not allowed to interrupt you, then do not interrupt her. If children are expected to clean up their own clutter, then keep an organized house. If you will be unable to follow your own rule, then you either need to adjust your behavior or reformulate the rule. 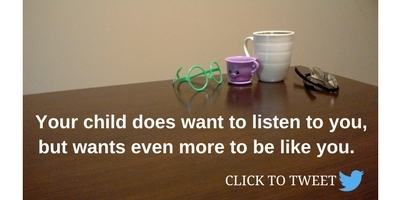 Despite what you may perceive, your child does desire to please you by listening to you. But she has an even stronger desire to be like you. Problems arise when you act in contradiction to your declared rules, because that sets these two desires in opposition to one another. Your inconsistency will make it impossible for your child to both listen to you and be like you. Her desire to be like you will prevail. She will lovingly perform imitations of your behavior that are destined to be greeted by reprimands. She may interpret the discrepancy as hypocrisy and come to resent you for it. When you instead practice what you preach, you make it easier for your child to adhere to the rules, and also prevent your relationship with your child from bearing needless stress. Some nuances that may be particularly difficult to convey to a small child are the types of privileges that may be earned non-uniformly by different players. These types of privileges may be earned on a responsibility-dependent, a development-dependent or an ability-dependent basis. Rules containing these types of nuances are fair because they extend the same opportunities to all players. The catch is that they do not guarantee the same outcome for all the players. So you as the parent may at times be perceived to be playing by an unfair set of rules when in fact you are not. Responsibility-dependent privileges are those that are granted commensurate with a player's demonstrated level of responsibility. For example, you have the privilege of choosing for yourself a later bedtime than that of your child. Adults are expected to choose a bedtime that does not interfere with their punctual waking, their next-day's obligations, nor their disposition. Additionally, adults have more tasks they need to accomplish in a given day, and therefore need more waking hours in which to do them. When your children have grown, you can explain, they will have the same privilege to choose a later bedtime, and the same responsibility to complete their duties with sufficient rest. For now, it is your responsibility to ensure they get enough rest and therefore your privilege to choose their bedtime. When my son turned five he argued that his 8:30 bedtime was too early, and that he was ready for the privilege of choosing his bedtime. At least the first part was true; he was no longer able to fall asleep at bedtime. So we granted him the privilege on a probationary basis, pending his successful management of responsibilities. The experiment lasted a few weeks, and was characterized by 10:30 bedtimes. It was also peppered with emotional meltdowns of higher frequency and greater intensity, which were traced back to insufficient rest. We ultimately reclaimed the bedtime-choosing privilege on the grounds that Son was not ready for the responsibility. We did, however, concede to a 9:00 bedtime which worked out for everybody. Development-dependent privileges are those that vary based on growth. Larger children may enjoy larger meals proportional to their appetites. Smaller children may be allowed to jump on furniture until they grow enough to potentially cause damage. Having these disparate set of permissions is not playing favorites. It is fair because the concessions become tailored to suit the individual as they change. You as the parent, for example, have the privilege of operating all of the kitchen equipment because the equipment is made and arranged for people of larger size. More importantly, adults generally have greater dexterity than children and are far less likely to injure themselves while preparing a full meal. As a safety measure, adults have the privilege of running the full kitchen. Ability-dependent privileges allow some to perform at a higher level than others. In a foot race, everyone has the same opportunity to win but that does not mean that everyone should take turns winning. The swiftest runner has the privilege of more victories by virtue of being faster. It would be fair if that player won every race. That does not mean of course, that you should trounce your child in every competition simply because you can. That would be no way for a child to develop a zest for competition. Nor should you lose every match, as that would be no way for the child to develop a realistic sense of her capabilities. Trust in yourself to know the right amount of competitive energy to inject into a game. It is a delicate balance, and the right balance may be different for every child. The important thing is that you get to model sportsmanship whether you win or lose. So win humbly and lose graciously so that your child may know to do the same. This is applicable in games as well as in more serious matters. You are more knowledgeable and intellectually superior to your child, at least for a while. By virtue of these advanced abilities, you will win most of the disagreements you have with your child. Win humbly. When you lose, you can verbalize how the child made a solid argument and based on that, you have either changed your mind or have come to appreciate a different perspective. This lets your child experience victory so she knows she has some control over her destiny. It can give her the confidence to further develop such critical life skills as persuasion and negotiation, and provide her with a model for losing graciously to emulate. It takes an even hand to judiciously apply the "equal opportunity but not necessarily equal outcome" axioms. Be careful not to misuse the nuances of responsibility-dependent, development-dependent, and ability-dependent privileges. As the authority in the house, you have the privilege of setting the rules and the corresponding responsibility for doing so in an equitable fashion. Your equitable nature will again come into play when rule breaking is suspected, in which case you play the role of referee. Everyone including children deserves impartial and fair hearings. So be sure to withhold judgment until you get the whole picture. In other words, do not simply accuse your child or assume her to be at fault unless you witnessed an infraction firsthand. Instead, give your child the benefit of the doubt and ask open-ended questions. When your child leaves the dinner table with sticky hands, for example, and you hear her opening doors and rummaging through things against your specific instructions, you might say, "Your hands are sticky and I told you to wash them before touching anything, but that's not what you are doing. Why?" You might learn that the towel had fallen on the floor and the child had the foresight to get a fresh one before starting to wash. Or the floor was wet and she was getting paper towels with which to dry it so she could stand in front of the sink without getting her socks wet. Or the soap was out and she needed to get more. These would all be valid reasons that you would never get to hear if you took a confrontational approach and bowled your child over with impatient incriminations and superior language skills. You would have instead lost credibility and respect with your child, while leaving her feeling helpless, depressed, and spiteful. Your child has valid perspectives that incorporate information that you may not have. Your child's perspectives deserve to be heard, free from a presumption of guilt. And when you grant her that, she can learn to guard against premature judgment whenever she suspects others of misdoings. Your authority to officiate over disputes, however, is not an obligation to do so. Certainly you can't be an omnipresent overlord, nipping all problems in the bud. When children are in disagreement with one another, sometimes they just need to work the differences out for themselves. Let the children try out different approaches to understand how they may work or not. They will, at times, implement unfair solutions, and will be able to see firsthand the damage caused. They will know that being unfair causes sadness, anger, and loneliness. This will help them to internalize a notion of fairness. When they do the right thing, they will know why they are doing the right thing, not just avoiding parental wrath. When it is appropriate for you to abstain from dispute resolution is a judgment call. When intervention is needed, you can put some of the execution in the hands of the children. For example, rather than correcting the offending child yourself, you may coach the victimized child to tell her playmate that she is not yet finished playing with a disputed toy. Some children may need to hear "She's not finished playing with that" from an authority figure a few times on their behalf before they are comfortable enough to start asserting their own rights in disputes with peers. By observing your fairness in this and other situations, the child will eventually begin displaying fair behavior herself. Author's Note: This is the fourth in a collection of posts about the example you set. Six different behaviors are covered. Read about compassion here, honesty here, fairness here, optimism here, and determination here. · What ways do you use fairness at home with your children? · When do you find it challenging to be fair? How to Properly Cite this Article: Brian Vondruska, “Fair Parents, Fair Children”, The Kind of Parent You Are, accessed [date], https://www.thekindofparentyouare.com/articles/fair-parents-fair-children.